Quite the crime that I have yet to review this classic on my blog. People get annoyed when this is spoken about as a zombie film, but I'm sorry it is, people don't need to be dead to be zombies, just look at Invasion of the Body Snatchers (pod people) and even Kaw (crazed birds). This is the film that introduced the running zombie to the mainstream audience. 28 Days after animal rights activists accidentally unleashed hell after freeing chimps infected with a 'Rage' virus from a lab Britain is in ruins with the majority of the population turned into mindless killers who mercilessly hunt down any non infected. 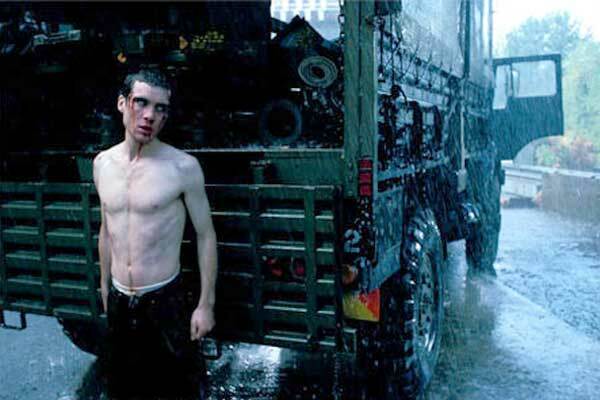 Jim (Cillian Murphy of Batman Begins, Inception) a courier wakes up in an abandoned hospital, having been taken there after a bike accident before the outbreak. Oblivious to what has occurred he wanders the dead streets of London until a couple of survivors rescue him from a pack of infected. Later on Jim and his new friend Selena (Naomie Harris of Skyfall) meet up with a father and his daughter. The four decide to depart out the city, to head toward the broadcast of a radio signal promising a cure for the infection. 28 Days Later is split into three distinct acts, the first act being Jim's journey through London. Much of the iconography of the films legacy is seen here, famous roads and landmarks empty, isolation to a giant degree that is impressive for how difficult it must have been to achieve this in one of the biggest cities of the world. The middle part of the film is the groups journey to the 'promised land' easily the worst part of the movie. A very soppy part of the film where the characters have lame discussions on life and the future. The part when they talk about horses is the nail in the coffin for this boring part. Then there is the amazing third act that as is often the case makes you question just who the real monsters are; the infected or the humans. This went onto influence the zombie genre as a whole, not a stretch to say that it was dramatic in creating the geeky battle grounds of runners VS shamblers! Both The Walking Dead and most notably the Dawn of the Dead remake were influenced with Dawn even having the same style of zombies. Not many people know though that 28 Days Later is basically a remake of John Wyndham's The Day of the Triffids. From the start to the finish the plot is near identical. Replacing the killer plants of Triffids with infected humans is the only real difference! The very first time I saw this film I was mightily confused due to the frantic quick pacing of the action scenes, I guess that being drunk also didn't help. A lot of the quick paced scenes are filmed with hand cameras with a quick succession of shots creating panic and confusion but also making it a bit difficult to make out what is happening. The infected look fantastic, all vomiting blood and red eyes, their twitching and barely contained anger really coming out. The soundtrack is inspired and adds fantastically to the goings on. 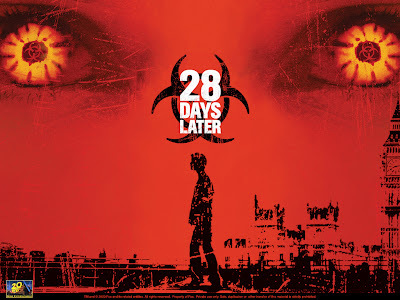 The stand out track of course being 'In the House In A Heartbeat' that returned for the sequel 28 Weeks Later that so perfectly compliments the action unfolding on screen. The cast is quite small and they hold together well, let down slightly by annoyingly voiced Hannah (Megan Burns) whose London accent just makes her sound bored throughout. 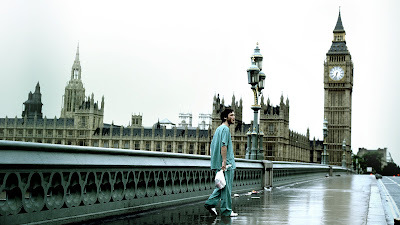 28 Days Later is a classic film but it is fair to say the weak middle part lets it down a bit as well as a few silly plot holes, and it does steal a bit too much from other sources to be defined as completely fresh. Despite that the first and third acts are so strong that it is a film that I still do repeated viewings of to this day.